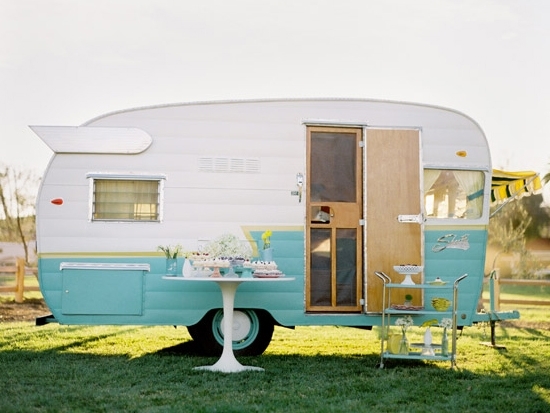 Homemakin and Decoratin: Trailer Shop Boutique? It is THE. MOST. ADORABLE. trailer I have EVER seen!!! ... and my husband think it's UGLY! I thought it would be SOOO cute and fun to have a trailer just like, color and all, take out the stove, bathroom and other parts and carry all my shop stuff in it, displayed all pretty (that is, when I make more stuff consistently and my shop grows!) and have the trailer as a little shop boutique! ... and my husband thinks I'm CRAZY! I said I'm looking for one of these darling babies when we have our own house someday to do just all of this! ... and my husband said he'd be EMBARRASSED! .. And my husband will love me anyways. .. I'm with you on this--that would make a great little shop. I've had me some shop fever myself lately but not the funds to make it happen.